Want to come over for brunch? OK? OK! Just please can we make it a little bit later in the day? Like not brunch at the crack of dawn? That would be called breakfast, anyway, I suppose. The thing is, I really like my sleep. And since I get up at 5:00 a.m. during the week, I really don’t like my alarm to go off before 8:00 on the weekends. And even when my alarm goes off and I have coffee in hand, my most ideal mornings consist of lounging around in bed, catching up on blogs and Twitter and reading a book or magazine. Then I’d obviously need a little time to get semi-presentable and put on clothes that don’t consist of leggings and a tee-shirt. So, I really don’t have any desire to have you at my house before 11:00. Hope that works for you! Also, do you mind if I wear my slippers? 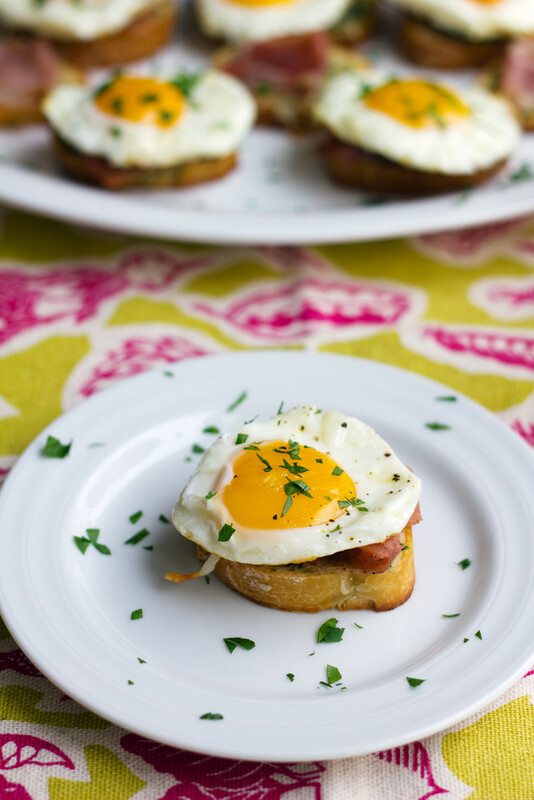 If it does, I’ll probably make you some Brunch Bruschetta because I made it a couple weeks ago and decided it would be the perfect thing to serve to some morning guests. Or early afternoon guests as the case may be. The best part (besides the butter, eggs, prosciutto, cheese, and bread) is that you can do a lot of the prep the day before. So, you really can roll out of bed, assemble, and entertain. I made the butter the day before by taking a stick of room temperature butter, a peeled and minced garlic clove, and 2 T finely chopped parsley mixing them together in a bowl. I sliced 12 rounds from a loaf of French bread and slathered butter on them. Baked them at 400 degrees for 4-5 minutes until bread was lightly toasted. And then took them out of the oven and sprinkled a little cheese on top of each. And prosciutto, too. Because why not?? I popped them back in the oven for 3-4 minutes to get the cheese all melty. 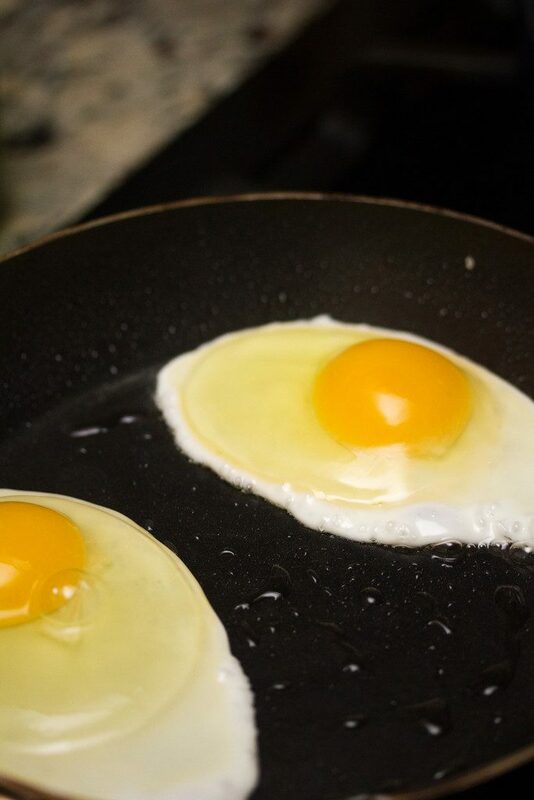 Then I fried up 12 eggs. 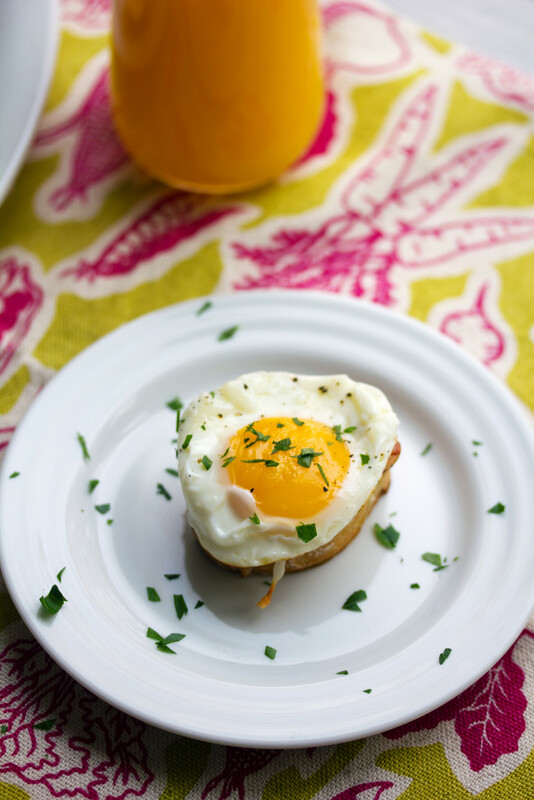 I used medium-sized eggs, but I think if you could find quail eggs, that would be even better. Obviously you’re going to top the toasts with the eggs for what I consider a pretty complete meal. Well, so long as you don’t forget the mimosas. OK, and maybe a fruit salad for balance. You should also probably sprinkle a little more parsley and some black pepper over the top. 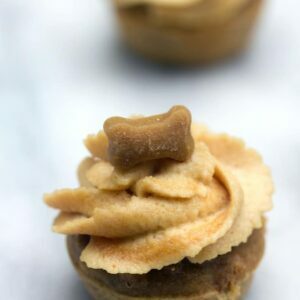 I don’t even feel like these little bites need too many words. You kind of just need to come over and try them for yourself. They have all the components that make up my dream brunch, aside from hollandaise sauce. Which, I mean, you could totally whip up a hollandaise sauce for these if you want. I don’t see anything wrong with that. Except that you’ll probably have to get out of bed a little bit earlier. But then, if you know these are waiting for you, getting out of bed in the morning won’t be such a difficult thing. If you live with someone who reallyyyy loves you, maybe they’ll even get up early and toast the butter slathered bread, so you can wake up to the glorious aromas. You’ll most likely have some butter left over after you spread it on the toasts. Just a warning, you should probably put the leftovers in the fridge, otherwise long after your guests leave, you’ll be still thinking about what else you can spread it on: sandwiches, Cheez-It, your finger, etc. 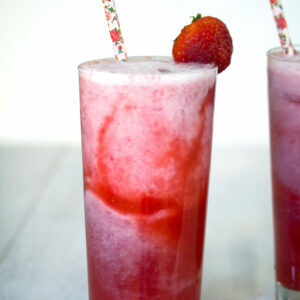 Now, excuse me while I think of ways I can make these on weekday mornings and pack them up for work. 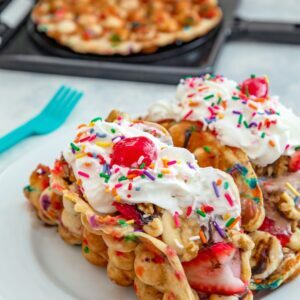 Would an electric griddle fit in my office? Where can I hide the butter so nobody steals it out of the work fridge? 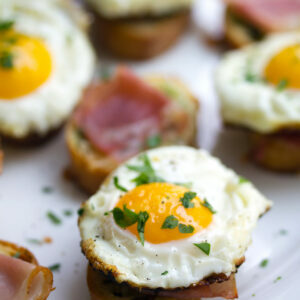 What’s your favorite brunch food for serving a small group? 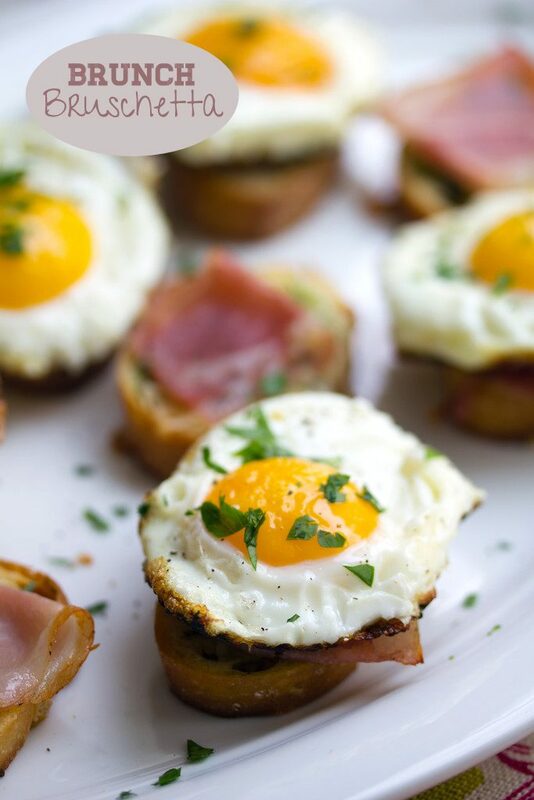 The perfect finger-food brunch dish to serve a crowd, these bruschetta are topped with everyone's favorite breakfast foods. Place stick of butter, peeled and minced garlic clove, and finely chopped parsley in a bowl and mix together until well combined. (Butter can be made ahead of time and kept in fridge. Bring to room temperature before spreading on bread). Slice 12 rounds from loaf of French bread and place on a baking sheet. 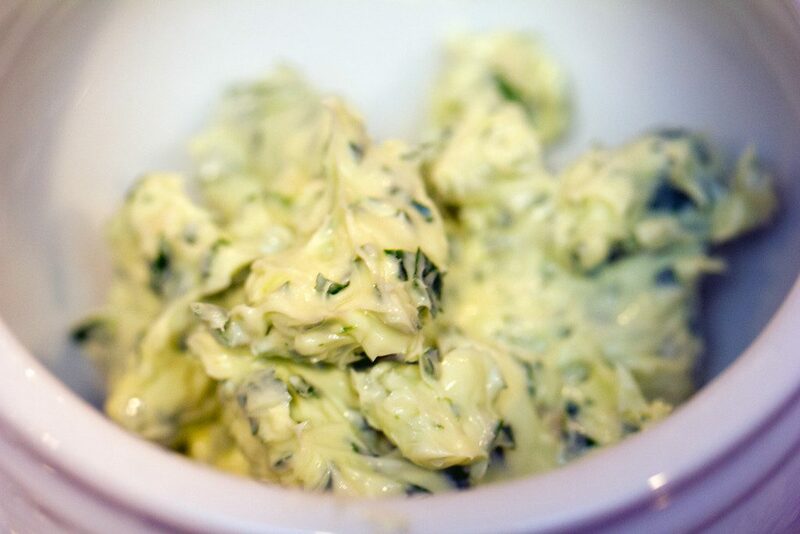 Slather butter on bread rounds. Bake bread at 400 degrees for 4-5 minutes until bread is lightly toasted. 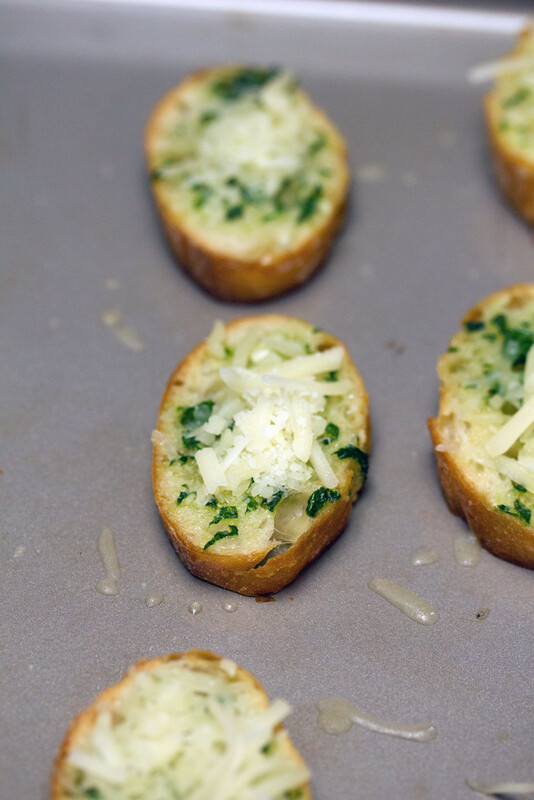 Remove from oven and sprinkle cheese on top of rounds. Return to oven for 3-4 minutes, to melt cheese. 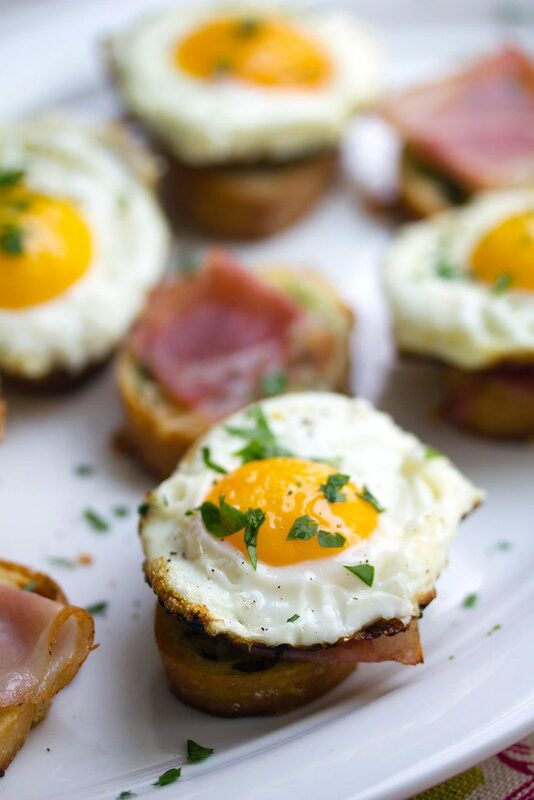 Place fried eggs on top of prosciutto. Sprinkle black pepper and additional minced parsley on top. 16 Responses to "Brunch Bruschetta"
This bruschetta looks fantastic! What a great breakfast idea! 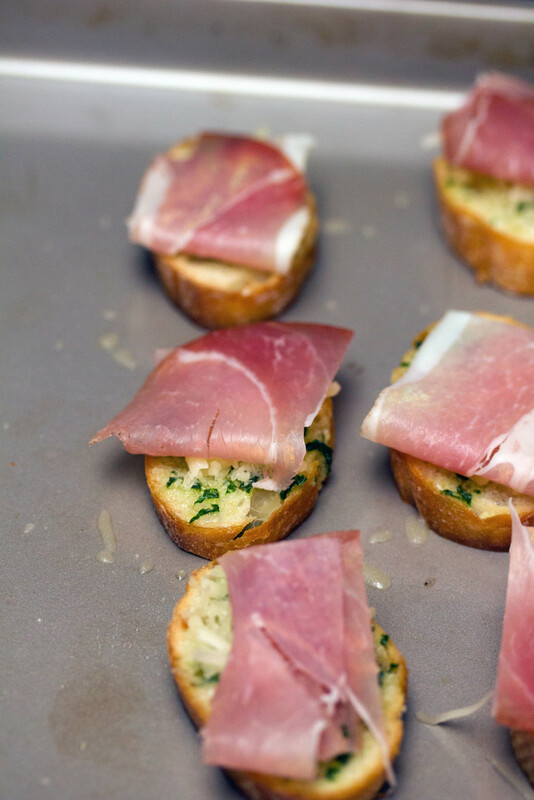 Love the prosciutto on there, too! That’s a perfect dish for brunch! Drooling over your photos. What a great idea! They look fantastic! Yes I will come over for this! Can we make it dinner?– I want it now! I love brunch and all kind of bruschetta! I made breakfast for 10 people a few weeks ago and whipped up a giant pan of scrambled eggs, then popped a couple of packs of bacon in the oven. 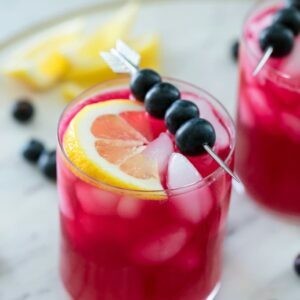 Served with toasted bread, butter, cream cheese, jam, and mimosas (always mimosas). Easy peasy. But next time I would definitely attempt something like this! Brunch is my favorite meal of the day! How did you know? 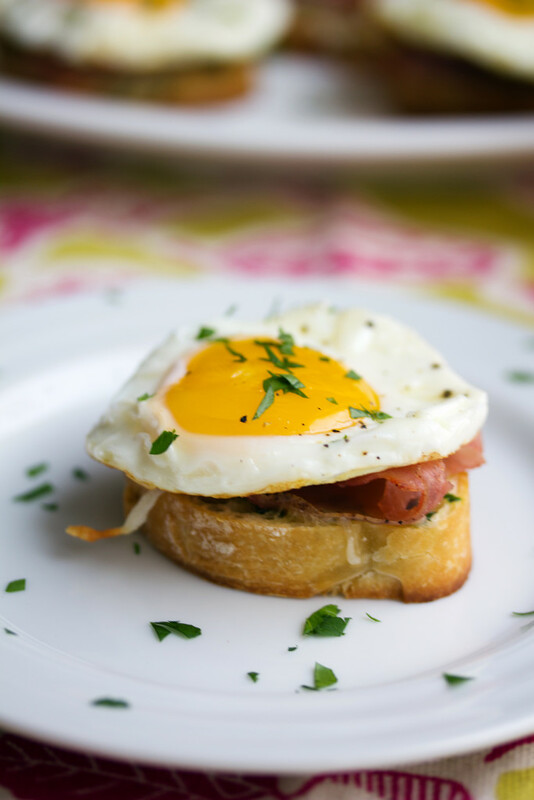 And I refuse to eat it if there are no runny egg yolks involved…so this bruschetta is music to my ears. I could definitely eat quite a few of these for breakfast anyday!! Yes, please! 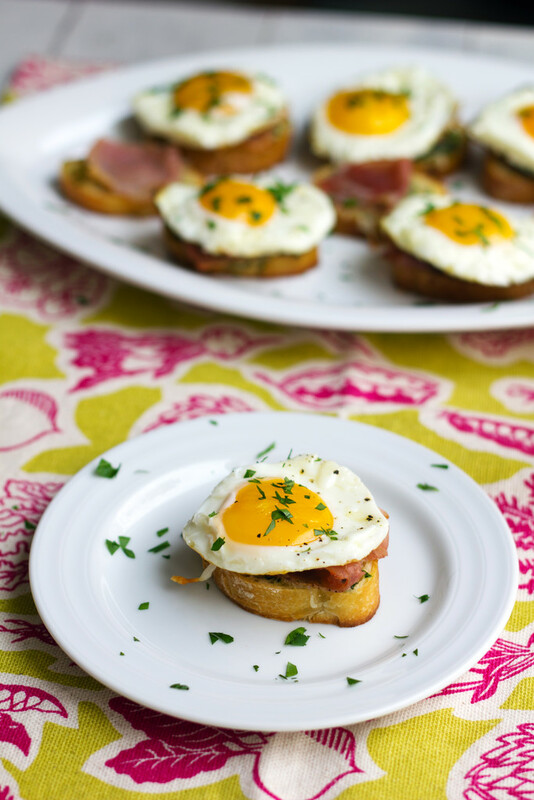 I want to come over for brunch, especially if it involves this bruschetta. 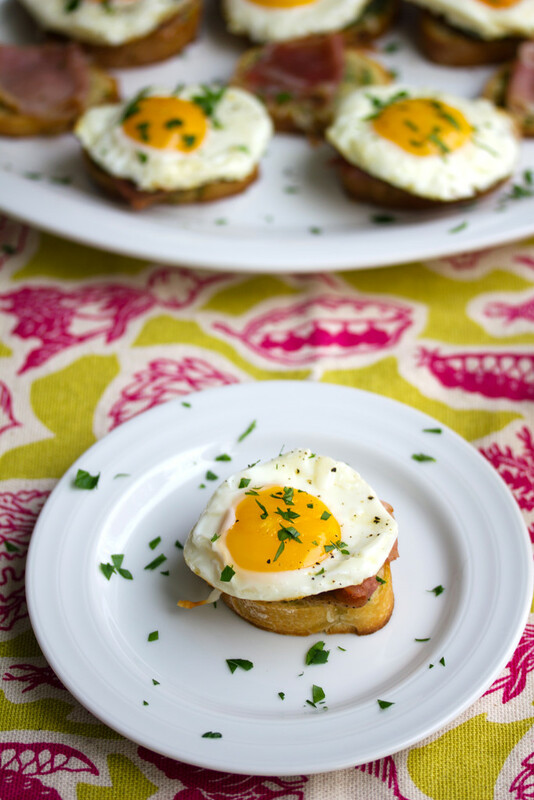 I love bruschetta and topping it off with garlic butter and egg is perfect! eeee how cute are these?! i’m having friends over for brunch on sunday and am now seriously considering adding this to the menu!! these look a) adorable and b) delicious. What a great idea! I am a massive brunch enthusiast.. there is nothing I love more than a good snack! 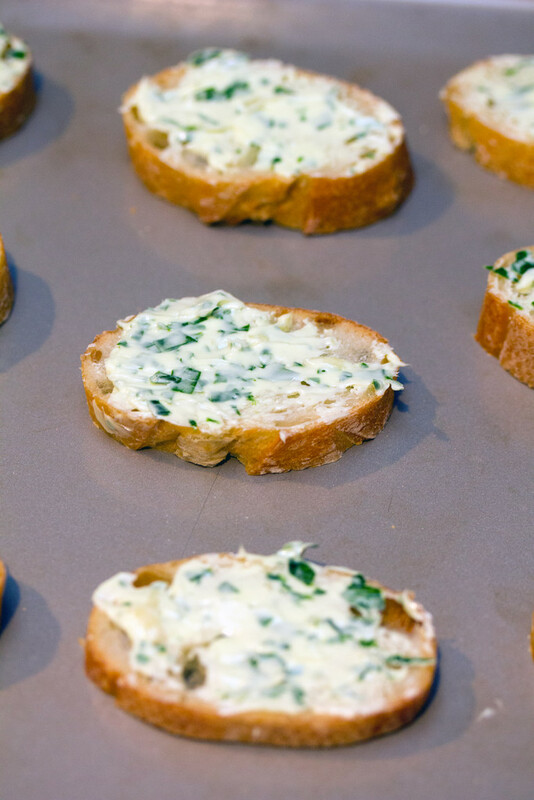 I have to make these bruschetta – they look like the perfect thing to serve and share.